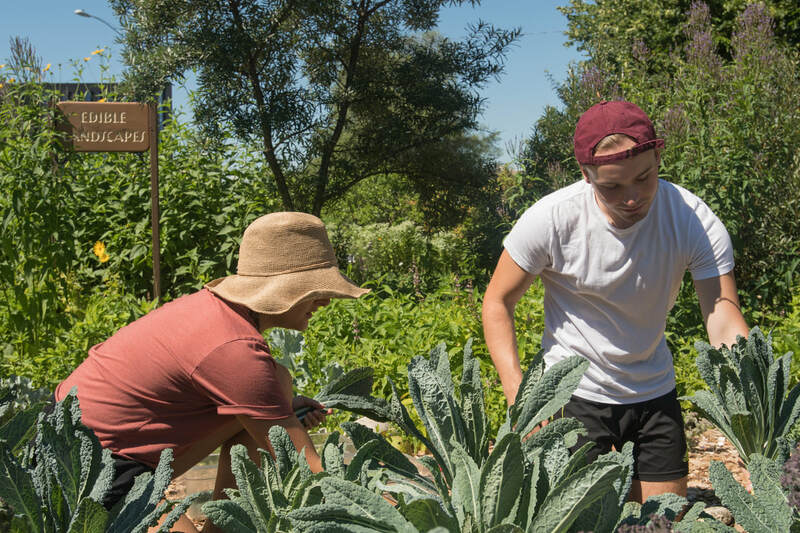 We're Hiring Our 2019 Permaculture summer crew! Are you looking for an exciting opportunity to enhance your gardening and sustainability skills? Want to be part of a team dedicated to Restorative ecology, open communication, and food? If so, consider applying to be a part of the UMass Permaculture summer crew. We work throughout the summer months to maintain our campus gardens while also offering community service to local projects. This is a great way to get hands-on experience with sustainable land care, permaculture design, medicinal plants, and more! You can find the entire job description and application here. To apply, please submit a completed job application form by Friday, April 5th. Erik Vegeto is currently a member of the Permaculture Initiative Practicum and garden crew. He is a student of Plant, Soil and Insect Science at Umass Amherst. His passion for restorative agriculture and environmental stewardship drives him forward into new frontiers of thought. Our appreciation goes out to Erik for allowing us to publish this post. What is permaculture? Permaculture is a vision for creating a healthy humanity. But it is not just about creating a healthy humanity, it is about creating a humanity that is a blessing for the universe. Our shared destiny involves overcoming the residual effects of historical oppressions, rousing ourselves from the sleep of myriad kinds of ignorance, and remembering the instructions which lay dormant within our instincts. These instructions guide us to be happy people, loving neighbors, and dutiful contributors to the global ecosystem. Permaculture believes that we are fundamentally worthy creatures, naturally capable of symbiotically relating to all beings. It is the belief, finally, that the Earth is a kind of cradle for the birth of a grand jubilee of life, of whose ultimate destiny is mysterious and cosmically important. In this reimagining of civilization, we hear the voices of our ancestors, whose primary concern was to ensure that whatever it was about human life that made it so beautiful, so rich and so good - that that survived. Our imagination about what’s possible seems to reach up to the stars. This ancient wisdom ensures we have no reason to be afraid: everything is in process like the development of an embryo or the germination of a seed; everything has a purpose, and everything is holy. There is no sting in death, only rebirth into newer forms and broader horizons. Though we have become estranged from nature, we are still invited back into the community of life, to prove our worth as creatures--as long as we are brave enough to venture into the mysteries of the wilderness unprotected by a sense of anthropocentrism. At the heart of permaculture is a mystery: what does it mean to be human? It seems our answer to that question has defined much in history. If our answer to that question is wrapped up in behavior that is harmful towards ourselves and others, as is the case when we measure human worth by our ability to dominate and exploit, then we have avoided a real answer to that question. Everyone shivers at the thought of death, at the existential question of--what is it all for? But if one sits with the fear of nothingness, and is able, though great courage, to look beyond it, they will find a definitive answer. Love is what makes all things in the universe meaningful. That is the basis for all that we do in the world. Permaculture, then, is the practical application of the presence of love in all of our relationships, efforts, and moments of wonder. With this in mind, it should be remembered always that taking caring of ourselves, each other, our neighborhood, our community, town, country and planet, is a behavior that has a cosmic basis and ultimate importance, because it all finds a place within the story of love. UMass Dining's Sustainability department is now hiring a Student Auxiliary Sustainability Coordinator. The Student Auxiliary Sustainability Coordinator supports projects currently in progress and works to promote new programs around purchasing local foods, reducing waste, engaging the campus community, etc. The majority of this role will be focused on supporting the community engagement and marketing objectives for the UMass Healthy and Sustainable Food System Initiative (UMHSFS). Start date is as early as March 5th, 10 - 15 hours per week at a rate of $13.00 per hour. Please see job description and application attached. ​Email kwicks@umass.edu if you have any questions. While 2018 may feel like an eternity ago, we would like to take a moment to reflect on some successes we braved within the Permaculture Initiative. Last year our ½ acre of combined gardens was able to produce over 1,700 pounds of produce! This includes 85 different herbs, fruits and vegetables that were harvested for the Student Farmer’s Markets and UMass dining. 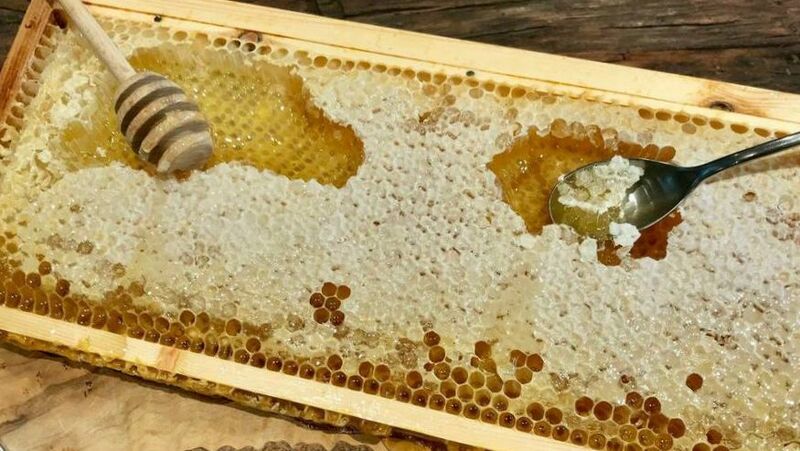 With our working hands we were able to install 2 new beehives, 4 new raised beds as well as a drying rack for our Franklin Garden! 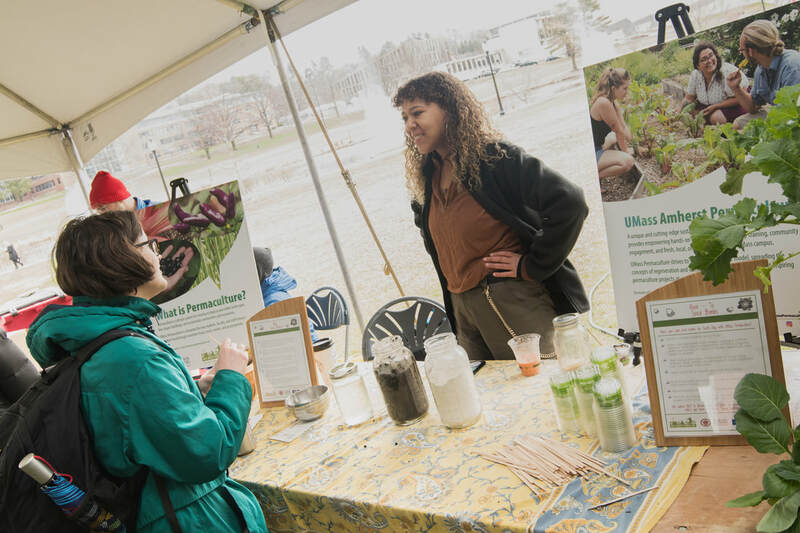 ​UMPI hosted 14 different events and 10 fall farmers’ markets throughout 2018 including a Food Justice market, a Handmade Holiday Gift Making workshop and our first annual Diet for a Cooler Planet event. At our Handmade Holiday Gift-making event, students were welcome to create sugar scrubs, heating packs, fire cider and wreaths. The wreaths were made out of wild grapevines as well as other natural materials foraged around campus such as spruce, pinecones and fir. We also made fire cider which is a great immunity booster that can fight off flu or colds. For the fire cider we used horseradish, chili and garlic from our garden, as well as onions, oranges, ginger, cinnamon and apple cider vinegar to create an infused tonic. This was a fun and educational gift for friends and family. For 2019 we are currently working on creating a three tier aerobic composting system as well as a vermicompost system. These systems will allow us to process our organic waste on site at the Franklin garden as opposed to off-sourcing our compost which we have been doing through the university. We are looking to coordinate a robust gleaning initiative by partnering with local farms to gather food that would have been left to decompose otherwise. We are hoping to bring the food harvested to the local Western Massachusetts Food Processing Center in Greenfield. This will allow us to wash, chop and freeze food that can later be consumed here on campus. Keep your eyes peeled for our 3 Spring Farmer’s Markets! We will be co-hosting markets starting in April where we will be offering some new products such as our elderberry syrup and currant jams. Looking for one more credit before the end of Add/Drop? We are offering a one credit Permaculture Practicum course where we will explore permaculture through hands on activities as well as dialogues, readings, outdoor classes, field trip and more! Limited spots are available. All of our work, past and future could not be done without the help of our volunteers, practicum students, summer crew and garden coordinators! Thank you for all your support! The UMass Student Farm is a student-run farm on campus that manages 14 acres of land and grows 35 different crops using ecologically sound practices. They supplied UMass Dining with over 10,000 lbs of local, fresh, organic vegetables in the past year. Produce from the Student Farm is featured in all four Dining Commons, at the weekly Student Farmers’ Market on Goodell Lawn, and at four Big Y locations.​ The Student Farm also offers Fall CSA (Community Supported Agriculture) shares to the campus community every year, enabling students, faculty, and staff to purchase a share in the farm and pick up over 25 pounds of fresh organic produce every week for ten weeks (September through November). This decision making power allows students to shape the program to their own learning objectives. For example, the 2018 crew made a lot of efforts on the farm to increase its environmental and social sustainability. This year the crew piloted inter-row cover cropping to reduce the amount of tillage, bare soil, and weeding that they had to do. 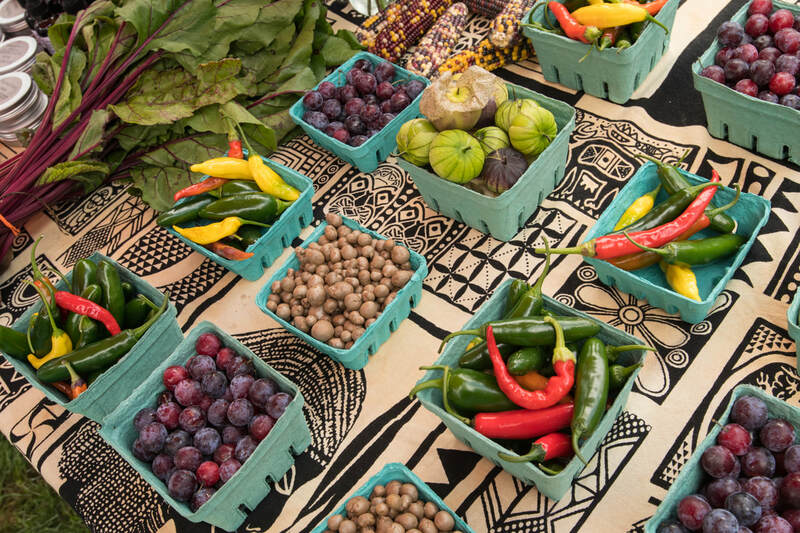 Additionally, in 2019 the Student Farm provided 25 free CSA shares to campus community members that would not have otherwise been able to afford them using grant money from the Sustainability Initiative and Engagement Fund. In partnership with the Food For All Program, they also worked to donate all of the excess produce, flowers, and fresh herbs from the farm to Not Bread Alone in Amherst and the Amherst Survival Center. Grace McKay and Sarah Berquist making a delivery to the Amherst Survival Center. Accepting donations of beets and flowers at Not Bread Alone. Farming is already an extremely difficult profession to be successful without 100% turnover each year and many first-time farmers running the operation. However, the Student Farm always manages to persevere and come out on top of whatever challenges they face. Kyle Zegel speaks to this, explaining, "This year was a really tough year. We had several intense heat waves, an incredibly wet late summer and fall, and several periods of labor shortage. We were hit hard with diseases ... and a lot of plants never made it into the ground, which made us short for our markets. 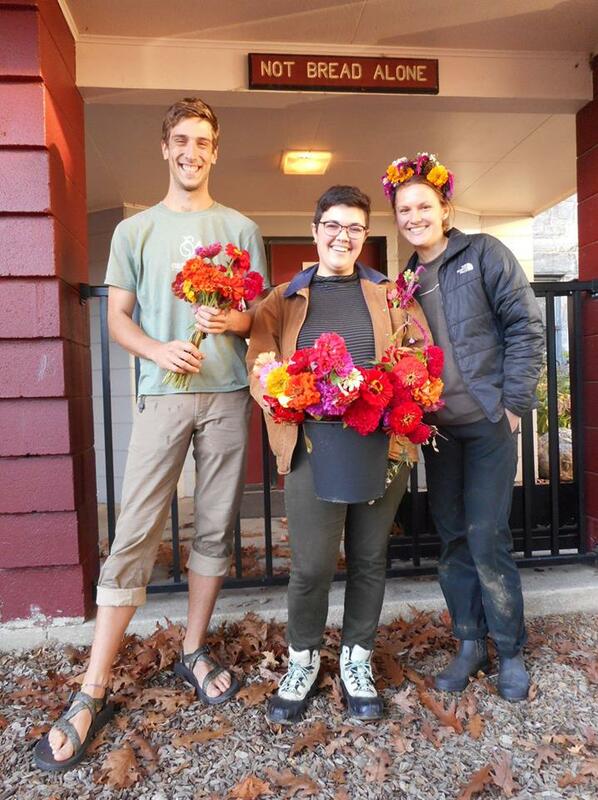 Carly Brand (pictured right) with Food For All students delivering flowers to Not Bread Alone. Sometimes we work in torrential downpours or near 100 degree heat. People get burnt out, sick and injured. We also have to constantly deal with the stress of crop failure and anxiety about finances, but what keeps me going on the toughest days is knowing that this work that we do is providing fresh, nutritious food to our community." Carly Brand add, "Even when it was painfully early or too cold to feel our toes, it felt worth it to be part of a strong, supportive community and to interact with our 'consumers' directly after. 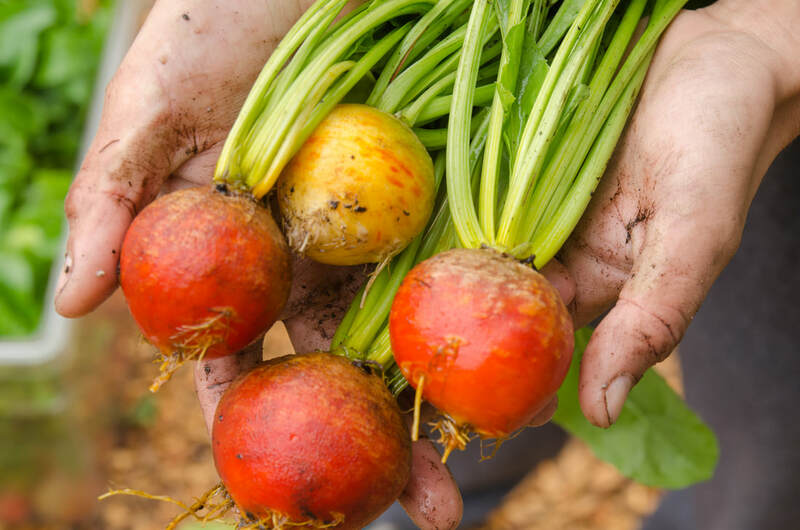 Working on the farm constantly reminds us to recognize the full value of the food we grow, and to do everything we can to prevent it from going to waste." CSA members picking up their weekly share at the Student Farmers' Market. Student Farmers Ainsley McStay and Sierra Torres washing swiss chard at the farm this summer. Kyle's advice to readers that care about where your food comes from is to "learn about agriculture and see if you can help farmers make their systems more sustainable. Go volunteer for food waste recovery and food equity organizations in your area and understand the extent of food insecurity in your area. The more involved you get with the growing, processing, and distribution of food, the more you'll be able to understand about what work needs to be done in our food system." 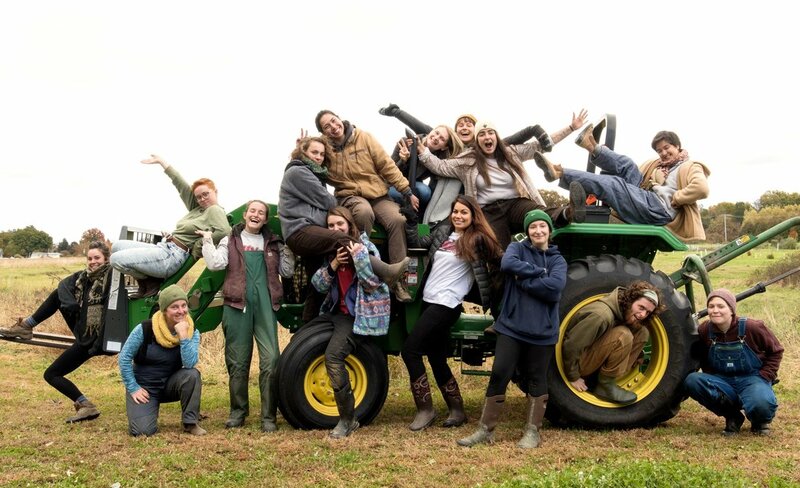 2018 Student Farm Crew pictured from left to right: Ainsley McStay, Amanda Brown, Kayleigh Boucher, Jackie Montminy, Jordan Lake, Lee Mcloughlin, Merav Dale, Nicole Mendes, Serena Hooper, Carly Brand, Sierra Torres, Sofia Cincotta, Kyle Zegel, Shannon Mo, and Avi Flynn. Thanks so much to Carly Brand, Kyle Zegel, and the rest of the Student Farm program at UMass for all of the hard work you do to provide our campus community with affordable organic produce every year! For more information about the Student Farm, visit their website. Sign ups for the 2020 CSA program will begin in March- be sure to catch their Early Bird discount! Consider making a donation to the Student Farm to fund free CSA shares for our campus community in 2019. A permaculture staff member and volunteer serving appetizers and greeting diners at the door. 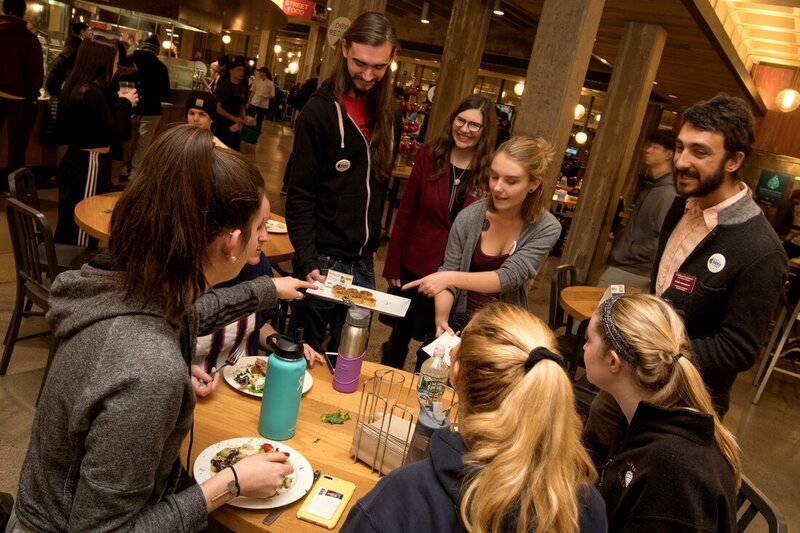 On November 27th 2018, UMass Dining hosted an event called Diet For A Cooler Planet that served a meal of delicious regenerative foods featuring contributions from local farms practicing alternative farming methods. The meal was served in all four dining commons on campus to highlight our local partners and encourage students to practice more mindful eating. Hampshire Dining Commons served additional appetizers and displayed of educational materials with student ambassadors available to engage with about how our food choices impact our climate. Below is a piece written by Meghan Sawtelle, a member of the 2018 UMass Permaculture summer garden crew and an undergraduate at UMass Amherst studying Sustainable Food and Farming. She shares her reflections on the Diet For A Cooler Planet Dinner and her experiences with some of the food featured at the event before it was served. UMass Permaculture staff and volunteers conversing with students enjoying the featured low carbon dishes. Upon entering the Hampshire dining hall, I was greeted by members of the UMass Permaculture Initiative, who served as a wealth of knowledge regarding everything being offered and its origin. Inside the Hampshire dining room, I was engulfed by an in depth look at the driving forces of permaculture and combating climate change through food, using informative panels and a screening of the Permaculture documentary ‘Inhabit’, starring one of our very own faculty, Lisa Depiano. 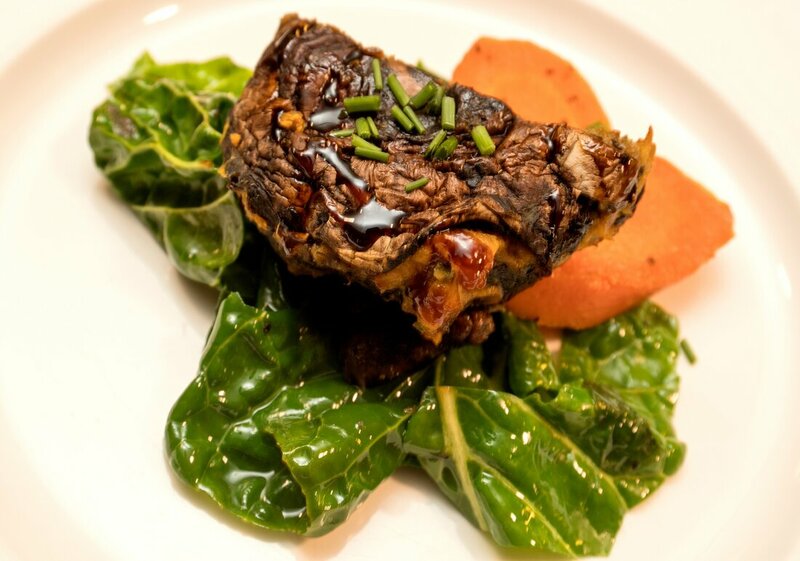 There was one dish that I felt especially moved by; that was the lamb that had been raised right on campus. Although I didn’t take part in the upbringing of the animals, I did visit them over the summer and helped to move them to a new pasture in the fall. Watching these creatures happily munch on grass while knowing full well they would end up on a plate gave me a lot to think about. 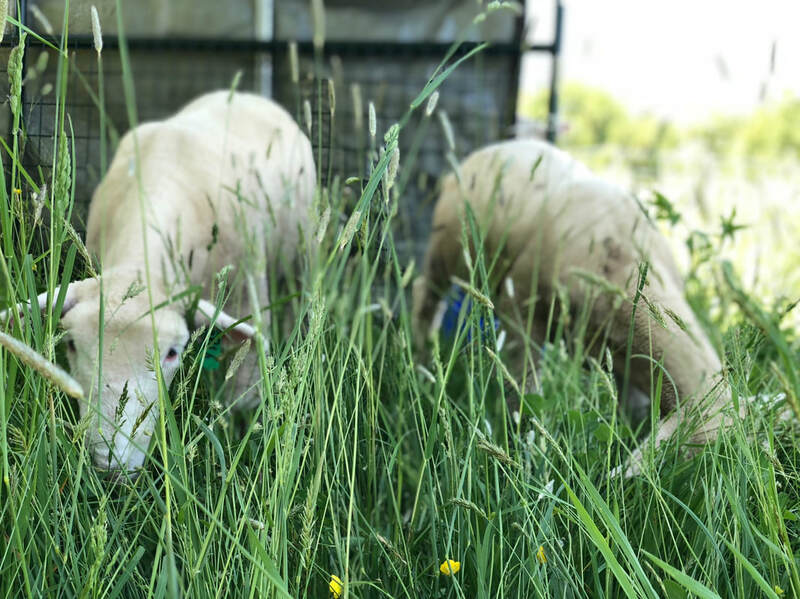 Two of the six sheep that were raised by students and faculty this year. However, it’s important to recognize how revolutionary their existence was; they were part of a silvopasture system, which is a regenerative farming method that combines tree crops and animal crops. The trees provide shade and forage while the animals control weeds and fertilize the soil. Establishing perennial tree crops helps to fight climate change by sequestering atmospheric carbon into biomass each year it grows, storing a large amount of carbon in the wood itself. Investing more of our agricultural land into establishing silvopasture systems could ease the stress on our nation's forests as fossil fuel use continues lurching us towards a less dependable future. 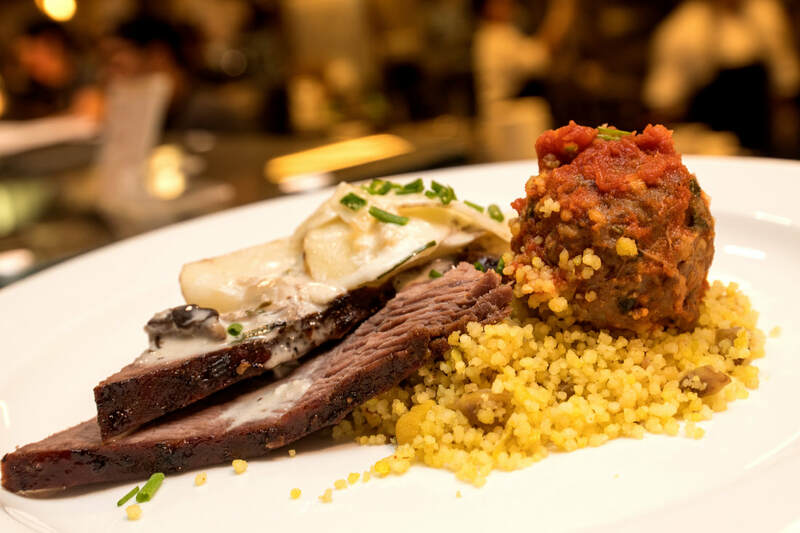 Lamb kefta tangine with sweet potatoes, couscous with chestnuts and apricots, herb rubbed local roast beef with mild mushroom ragout, and caramelized onion scalloped potatoes. Roasted sunchokes grown on campus with topped brussels and bacon. Navigating through the chaos of a dining hall after 7pm, my heart was set on engaging in the final step of raising meat animals, dinner time. I took a deep breath as I served myself the mouthwatering cumin lamb and wheat noodle dish that had been prepared; it felt necessary to ground myself as I have never eaten something that had once nibbled on my pant leg. Along with lentil pate, butternut pakoras, and chestnut onion goat cheese tarts, by the end of the evening my stomach was just as full as my heart. 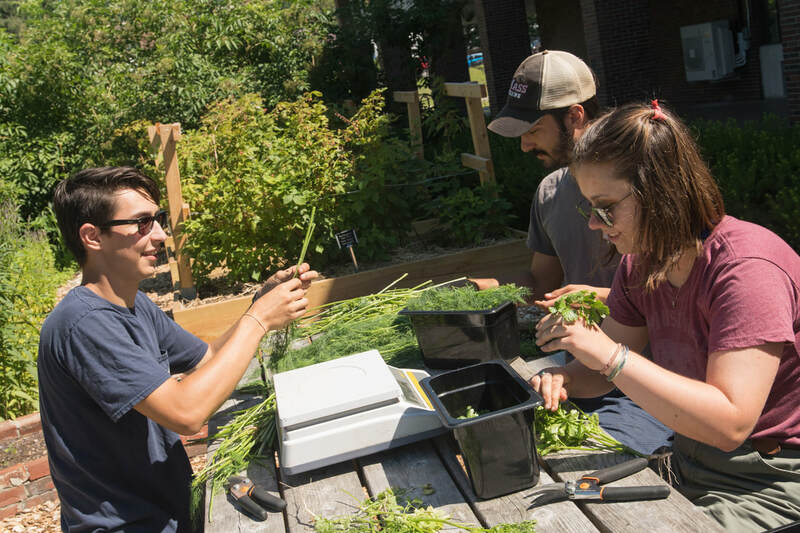 Meghan Sawtelle, pictured right, bunching herbs in the summer of 2018 in the UMass Permaculture Gardens. Thanks so much to Meghan Sawtelle for writing this blog and to Sustainable Food and Farming for co-sponsoring the event. And of course a huge thanks to our farm partners for this event: UMass Student Farm, PT Farms, Fungi Ally, Joe Czajkowski Farm, UMass Permcaulture Gardens, and Maine Family Farms. 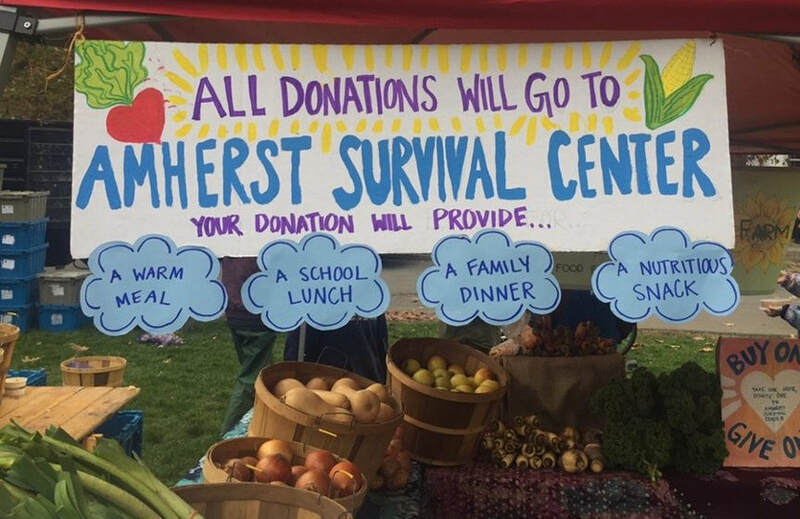 Student Farm's fresh food drive signage at their Farm Stand. On November 9th, the Student Farmers’ Market held a Food For All Market with an attempt to address the stigma on hunger around campus. UMass Permaculture, the Food For All Program, and the Student Farm teamed up to organize this exciting Market, which featured a fresh and canned food drive, opportunities to engage in conversation with knowledgeable students about local food security, and information about resources available on campus and in the area for people experiencing food insecurity. Throughout the market, community members talked about food recovery and food access over free soup and cider. 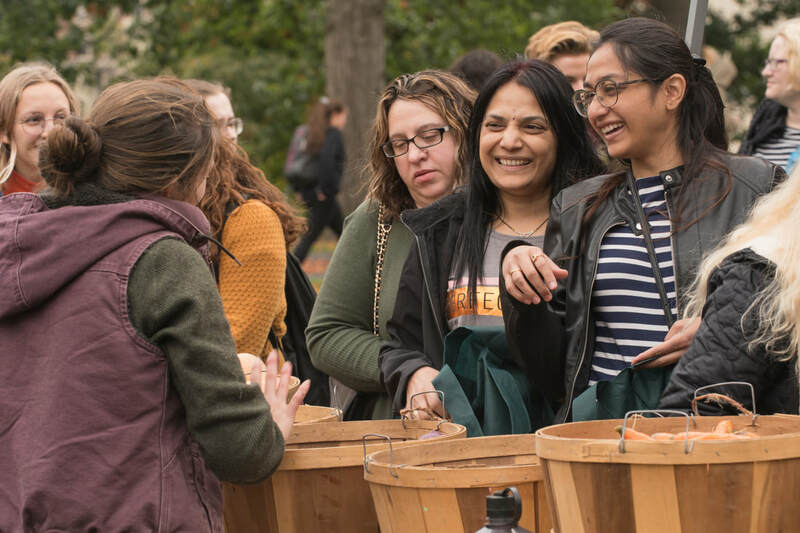 UMass Permaculture provided free sweet potato soup using gleaned sweet potatoes from Czajkowski Farm in Hadley and fresh pressed apple cider with Student Farm and Cold Spring Orchard apples. The Food For All Program handed out the rest of the sweet potatoes their practicum class had gleaned together a few weeks before for free along with free butternut squash donated by the Student Farm. Dan Bensonoff, UMass Permaculture, serves free gleaned sweet potato soup. Liam Davis and Courtney Spera admire the work of their peers before the market begins. Food For All also set up a booth with a detailed map of the food system displayed next to a poster listing all of the resources available for students and community members to access free food on campus and in the area. Student Farmer Jordan Lake created a zine that compiled all of the resources available on campus that were handed out for free throughout the market as well. Food For All students conversed with market-goers and invited them to ask themselves what they could do to support their food insecure peers. 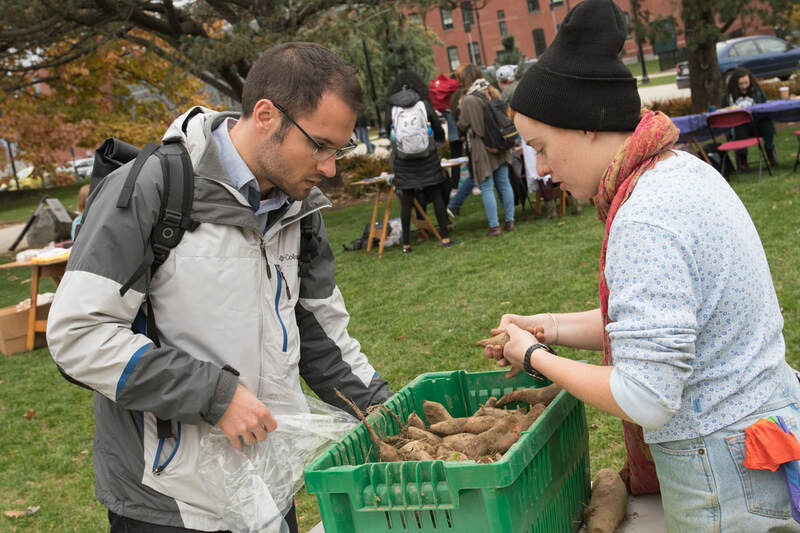 Kayleigh Boucher (right), program manager of Food For All, helps a community member sort through gleaned sweet potatoes to take home. Most people are surprised by the high rates of food insecurity on this campus but up to 23% of undergraduate students and 26% of graduate students cut or skipped a meal because they didn’t have enough money to buy food (Clark & Harris, 2015). It is vitally important that we keep talking about food access, work to reduce the stigma around hunger, stand up for each others' right to food, and keep everybody fed! -- Share the food resources that are available and distribute that information through any channels that you have access to by checking out this website. --Download the Food For All Zine and distribute widely! -- Include resources or the Food For All Zine on campus on your syllabus (or ask your professors to). -- If you have a meal plan, join the Need a Swipe? Got a Swipe? Facebook page and post when you have extra swipes and dining dollars to share! Food For All with bins of gleaned sweet potatoes for the Food For All Market. -- Sign up to help the Food Recovery Network donate food from the Dining Commons to local relief organization Craig's Doors. ​-- Volunteer or donate shelf-stable food items to the Student Food Pantry on campus and spread the word to people you know about their new location and hours. For a list of available food resources on and off campus, or to download the Food For All Zine, click here! Endless gratitude to Food For All students Kayleigh Boucher, Melissa Bonaccorso, Braeden Leinhart, Courtney Spera, Jackie Williams, Alex Androsko, and Liam Davis, as well as Student Farmers Avi Flynn, Jordan Lake, Lee Mcloughlin, Carly Brand, and Jackie Montminy, who made this event happen. Our Student Garden Coordinator tabling at the Sustainability Fair last Spring. ​The UMass Permaculture Initiative (UMPI) is looking for a new part-time Student Garden Coordinator! You can find details about the position here. 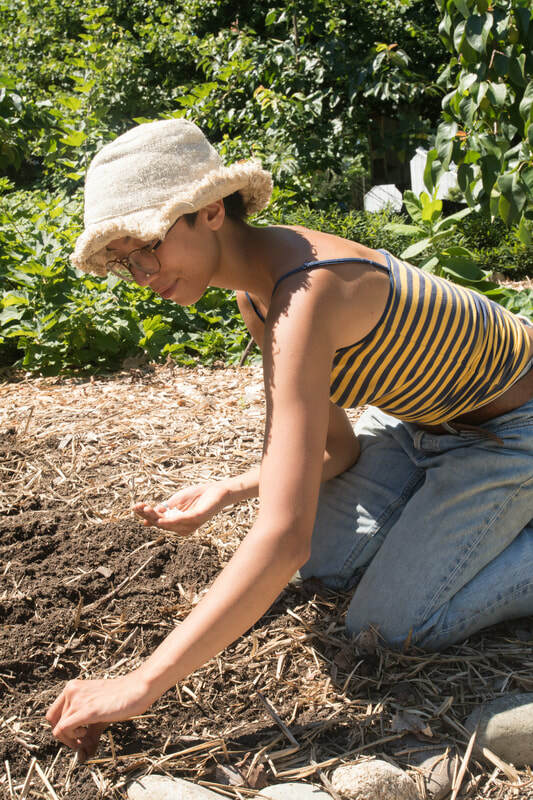 The Student Garden Coordinator works under the Sustainability Coordinator of Campus Gardens to support the planning and upkeep of the UMass Permaculture gardens and education of garden visitors. For this role, the Student Garden Coordinator will work part-time for two semesters and the summer. This position works with all those who come through the garden, including volunteers, tour groups, and the UMass Permaculture Garden Crew. We consider the Student Garden Coordinator role an apprenticeship, to be fully immersed in all elements of the UMass Permaculture program. A student planting in the gardens. Golden beets harvested from the Franklin Permaculture Garden. Cayenne peppers picked for the Student Farmers' Market. This is a wonderful opportunity for those who want to cultivate an eco-conscious community on campus. An ideal candidate would be someone with some practical experience in sustainable agriculture and permaculture design along with the ability to skillfully work with diverse groups of people in an educational setting. To apply, please fill out this form. For more information please contact Dan Bensonoff at info@umasspermaculture. 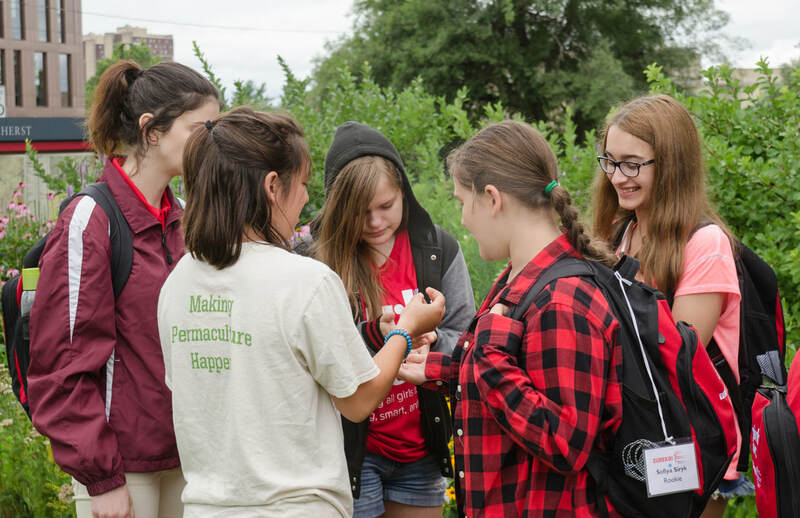 A Student Garden Coordinator passing out herbs during a workshop over the summer. 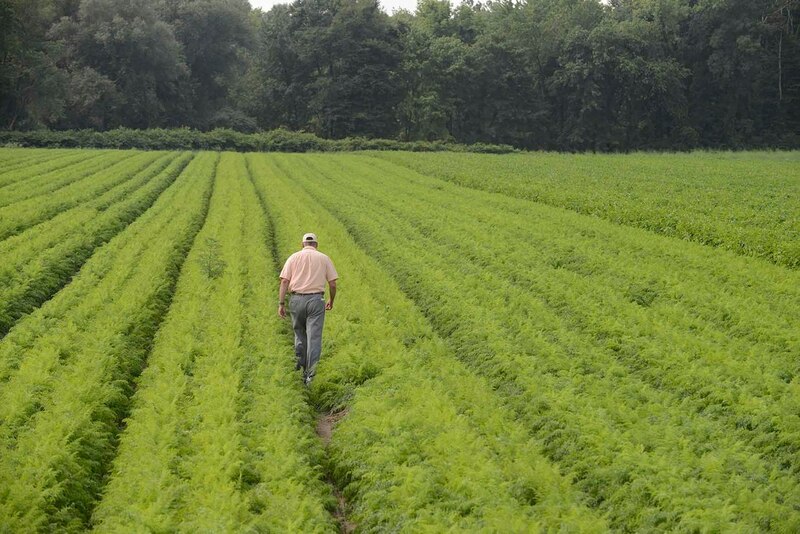 Joe Czajkowski Farms carrot fields in Hadley, MA. 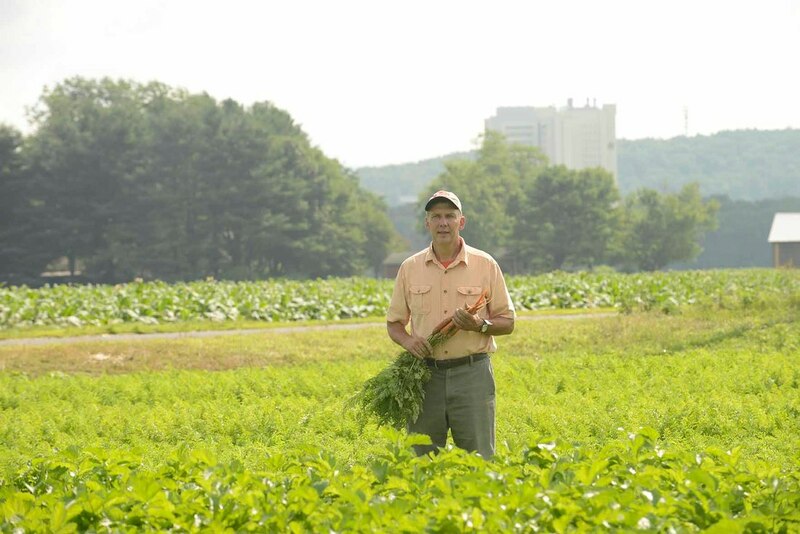 Joe Czajkowski Farm, located in Hadley, MA, has been supplying food to UMass Dining since 2015 and is owned by Joe Czajkowski, a third generation farmer. 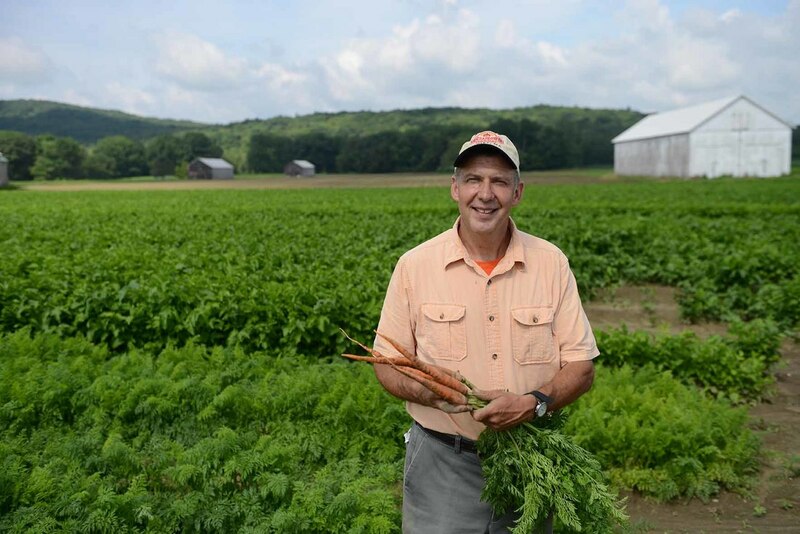 Joe's 400 acre farm grows a wide variety of crops including corn, winter squash, summer squash, sweet potatoes, carrots, strawberries and many more. UMass Dining purchases from Joe year round and in the last fiscal year they purchased over 2 million lbs of produce from him which is over $500,000 of food. Joe Czajkowski, owner of Joe Czajkowski Farms. In a field of carrots with a view of the UMass Lederle Graduate Research Tower. Joe also shares land with other farms. After spending over a hundred years in the Valley, farmers know each other's operations well. Neighboring farms will rotate their crops on each others' land to avoid disease and pest pressure that is unavoidable when you grow large amounts of anything in the same fields year after year. This year nearly a third of the squash crop in the valley was lost to disease. 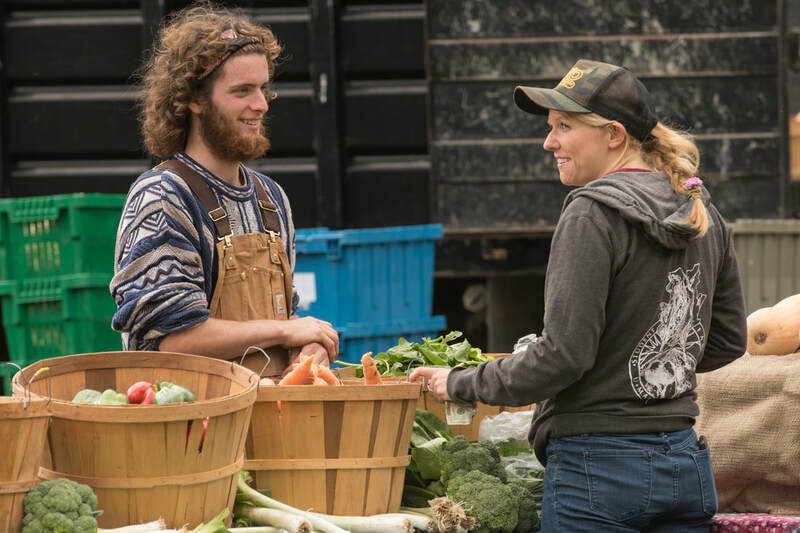 ​Partnerships like these allow farmers to share resources, knowledge, and connections and support each other in our local food community. ​A huge thanks to Joe for supplying our campus with local food! For more information about his operation or to visit the farm, check out their website. Join us for a foray around campus on October 10th from 3:00-5:00 PM to identify, gather, and eat wild edible foods. Registration Required. Email info@umasspermaculture.com to save a spot. 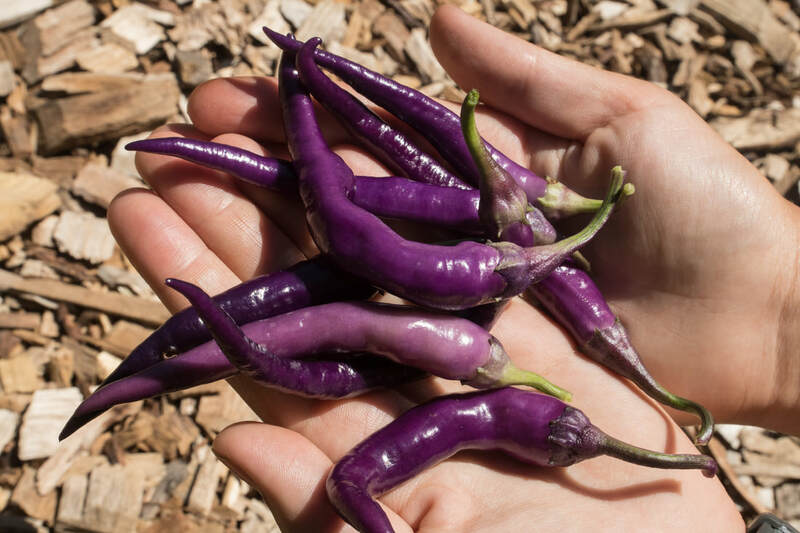 Led by our Coordinator of Campus Gardens Dan Bensonoff, our Fall Foraging Walks will help you to identify the abundance around you right on campus. We'll learn about the ethics and sustainability of wild harvesting as well as some of the nutritional profiles of the foods we find. Possible wild edibles for this walk may include: black walnuts, acorns, hickory nuts, wild apples, primrose root, daylily tubers and more. Don't forget to register to participate! The Student Farmers' Market runs every Friday at the Goodell Lawn from 12:00pm - 4:00pm until November 16th! 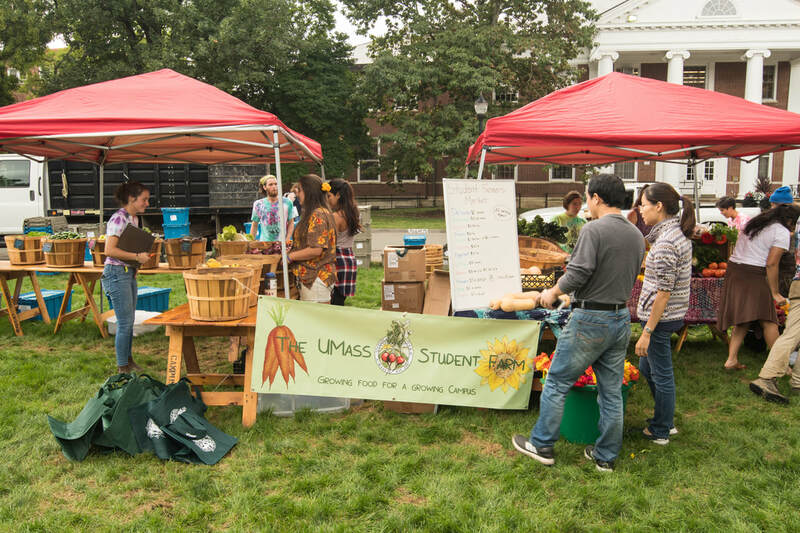 ​A collaboration between the UMass Permaculture Initiative and the UMass Student Farm, the UMass Student Farmers' Market is a weekly event featuring live music, fresh local veggies, medicinal herbs, handmade crafts, student art, and an opportunity to get to know the amazing agricultural community on the UMass campus. The Farmers' Market is also the location of the Student Farm's CSA pickups. Students or student organizations within the Five College Consortium are encouraged to perform, vend, or table at the market. If you would like to become a vendor or performer at the market, sign up here! Join us to plant, harvest, cultivate, and learn fundamental gardening skills for a greener future. All are welcome! No need to RSVP. For more information or questions about these events, please email info@umasspermaculture.com.